Runway Incursion can be defined as “Any occurrence at an airfield that involves the incorrect presence of an aircraft, vehicle or person within the protected area designated for the landing and take-off of aircraft”. It should be noted that an incursion may be a consequence of an error of a pilot or vehicle driver to comply with an air traffic clearance. The main effect is the increased risk of collision for aircraft on the ground. STRIDE is an Atg airports’ runway incursion system that is designed to detect the unauthorised entry onto the runway area when a stopbar is raised. This is achieved through the use of 2 sets of Microwave Detection Barriers (MDB) placed after the stopbar, the first set at the 3m point and the second set at 45m beyond the stopbar. The system will also provide audible and visual alarms in the tower, and can also be used to select ‘Runway Status Lights’ on if installed. Under normal circumstances the MBD units can also be used to automatically re-select the stopbar and extinguish any lead on lights when an aircraft has moved safely through the monitored area. SMARTCONTROL is operational at the Isle of Man airport, and the STRIDE system has recently been installed on one stopbar in order to monitor its performance before rolling out to others. The functionality of the system, was agreed in a design specification which was written around the operation of the airport’s needs. For each stopbar a different functionality can be configured dependant on the airport’s requirements and lighting arrangements. 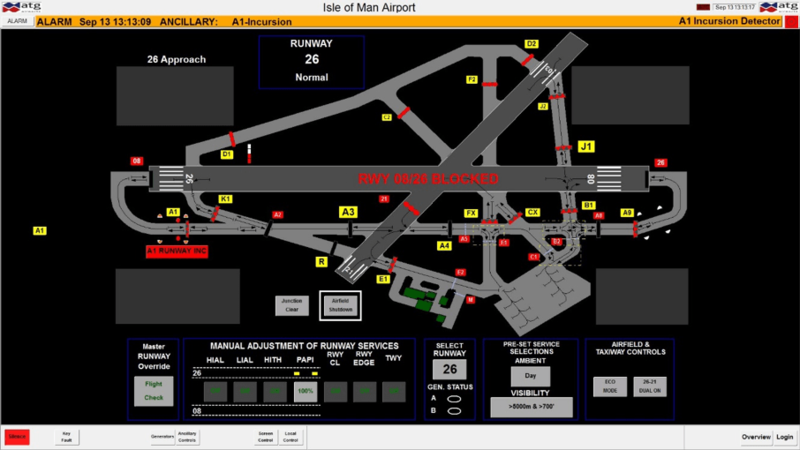 The configuration at the Isle of Man was to employ two stages of alarm and visual representation on the airfield overview. The new software was uploaded while the engineering team were on site completing the installation of the MDB equipment. A ‘stage 1’ incursion is triggered when a vehicle crosses the illuminated stopbar at Alpha 1 (A1), a visual indication shows on the airfield mimic. This brings up an alarm banner and also an “A1 RUNWAY INC” label on the mimic. A ‘stage 2’ incursion is triggered when the vehicle or aircraft has crossed the lit A1 stopbar and also breaks the MDB 1 and then breaks MDB 2 beams. This then brings a critical alarm and a runway blocked banner on the mimic “RWY 08/26 BLOCKED” is displayed. Once the airfield controller has addressed the situation for either of the both scenarios, the alarms can be cleared and normal operations resumed. For scheduled maintenance and servicing requirements the incursion system can be taken out of service by engineering team from the terminal located in the engineering wing. Full functional testing of the system for all different scenarios were completed, to ensure that all requirements had been covered and the system was fully functional.